According to techcrunch.com, a new 3D printer (which acts more as a laser cutter) is capable of carving out softer, more snuggly items. It may come as no surprise that this project was created by the Disney company, whose empire trades in snuggly things like Afghanistan slings raw opium. 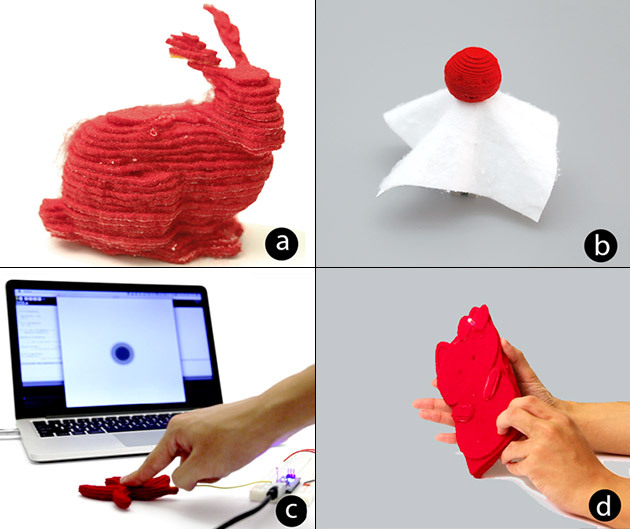 Along with researchers from Cornell and CMU, the new device uses layers of fabric to create cuddly creatures. The Diz expands its biz. Using a sliced 3D model, a laser cutter slices out 2D shapes from heavy-duty felt. The slices are then stacked on a platform and subjected to a vacuum, and heated so that the felt-s adhesive backing joins to the other layers. The layers then ascend and, when the surrounding support fabric is removed, the desired shape has been formed. Different internal cuts can add flexibility to the items. While the accuracy of the shapes' resolution isn't amazing, and the adhesive does not seem durable enough to create lasting stuffed keepsakes of the type that Disney could sling by the millions, the 3D printed felt friends could serve as good prototypes for other Disney toys. Add a little conductive fabric, and the electronic ante is upped. Who knows where the huggable future could go? It's no Thumper or Brer Rabbit, but it might lead to more interesting inventions.